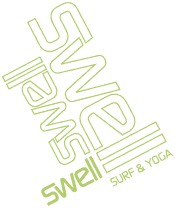 For those that want to stay up to date with Swell Surf Camp, here are the best networks were Swell posts on a regular basis. The winter season has properly started here in the Dominican Republic, lots of weeks are fully booked, and the last few weeks it has already been almost 100% full. Which means the vibe has been awesome. And the surf has been great too, we had some solid overhead clean waves where the pros were getting barreled and good long rides at Encuentro and other surf spots found on the north coast of the Dominican republic. We hope to see welcome you all soon in the Caribbean’s best surf Camp.